WordPress Mobile Version Subdomain is needed to offload the traffic, to increase readability, professionalism, SEO, Make Money using Specific AdSense units. You can also read SEO Guide for optimizing mobile site in this context. In order to create a subdomain follow the usual specific rules. For Rackspace Cloud Sites users, this guide will work partially to create a subdomain for our Wordpress Mobile Version Subdomain project. Those who are using our Pilot project of Full Managed WordPress Cloud Hosting, nothing needed to be done. We already included WordPress Mobile Version Subdomain, you can access it using – m.yourdomain.com structure. Professionalism : It looks good to have a m or mobile version. WordPress Mobile Version Subdomain is an Industrial standard. SEO : You can optimize WordPress Mobile Version Subdomain in the way you want subtracting the not needed parts of a regular version website. Make Money : If AdSense units are added directly, except Android device, they can appear very badly. You can use specific Adverts for WordPress Mobile Version Subdomain. Better control : Quite obvious WordPress Mobile Version Subdomain is a robust configuration than simple plugin usage. Offloading the main domain’s pressure : There is no meaning to show a 1200 px wide website to a 200 px screen mobile user. Smooth and speedy page loading for the Wordpress Mobile Version Subdomain. We have lightly touched this point at the beginning of this article. The red circled areas are with typical default settings. You need to change them accordingly so that the grayed out option field “mobile domains” will be active and you can add the url of your WordPress Mobile Version Subdomain. Add link to main website near navigation system to switch to desktop version from WordPress Mobile Version Subdomain. Submit corresponding mobile sitemap to the search engines. Add appropiate AdSense or other Adverts (if applicable) to the WordPress Mobile Version Subdomain. Match the color and logo of WordPress Mobile Version Subdomain with your main website’s theme. This Article Has Been Shared 5443 Times! WordPress Cloud Hosting can give you more flexibilities at cheapest cost than WordPress hosted on old traditional servers, its a luxury car with good mileage. 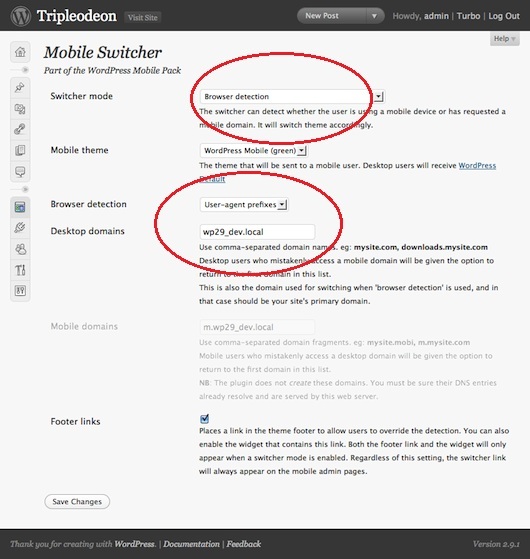 Cite this article as: Abhishek Ghosh, "WordPress Mobile Version Subdomain : Full Guide For Creation," in The Customize Windows, February 8, 2012, April 19, 2019, https://thecustomizewindows.com/2012/02/wordpress-mobile-version-subdomain-full-guide-for-creation/.